Repairing your car’s AC can be a complicated or simple project depending on what’s wrong with it. With most things in your vehicle, a better understanding of the components and what they do will help you diagnose the problem and determine the best and most inexpensive solution. The air conditioning system in modern vehicles has 5 major components that are connected by hoses or pipes. The AC system in your car all starts with the compressor. The compressor is usually bolted to the front of your engine and powered by a belt connected to the crank pulley on your motor. Even though the belt is always moving around the AC compressor pulley, it also has a clutch that can engage the pulley to compress refrigerant when the AC is turned on, or the clutch can disengage allowing the compressor to rest, increasing fuel mileage and the life of your AC system. An AC compressor may fail due to a lack of lubrication in the refrigerant, the clutch may wear out or it may develop a leak. You can check for a failed clutch by watching the center of the compressor pulley while the air conditioner is turned on and the engine is running, while also testing the system pressure to verify the presence of the right amount of refrigerant. Remember a broken AC compressor clutch may be a mechanical or an electrical failure. The warm compressed refrigerant is then transferred by a hose or pipe to the condenser. The condenser is usually near the front of the vehicle because it needs ambient air to pass through it to cool the warm compressed refrigerant to an ambient temperature liquid. Since the condenser is at the front of your vehicle it’s most likely failure is a leak, either due to a failed O-ring where one of the refrigerant lines enters or exits, or due to road debris puncturing it. After the refrigerant is a cooled to an ambient temperature by the condenser, it is passed through the receiver or dryer. This device holds a certain amount of refrigerant and accumulates it before it passes to the rest of the system. This accumulation process ensures that all of the refrigerant is now a liquid instead of a gas and is safe to continue through the rest of the system. The dryer also can help filter out any contamination that may be in your air conditioning system. The refrigerant then travels on to the expansion valve which is the secret to the air conditioning system. At the expansion valve, the ambient temperature high pressure refrigerant is allowed to expand very quickly taking advantage of the Joule-Thompson effect. This scientific principle states that, as a gas, it is allowed to expand quicklyso the temperature of that gas will drop significantly. This cold refrigerant can then go on to cool your vehicle. 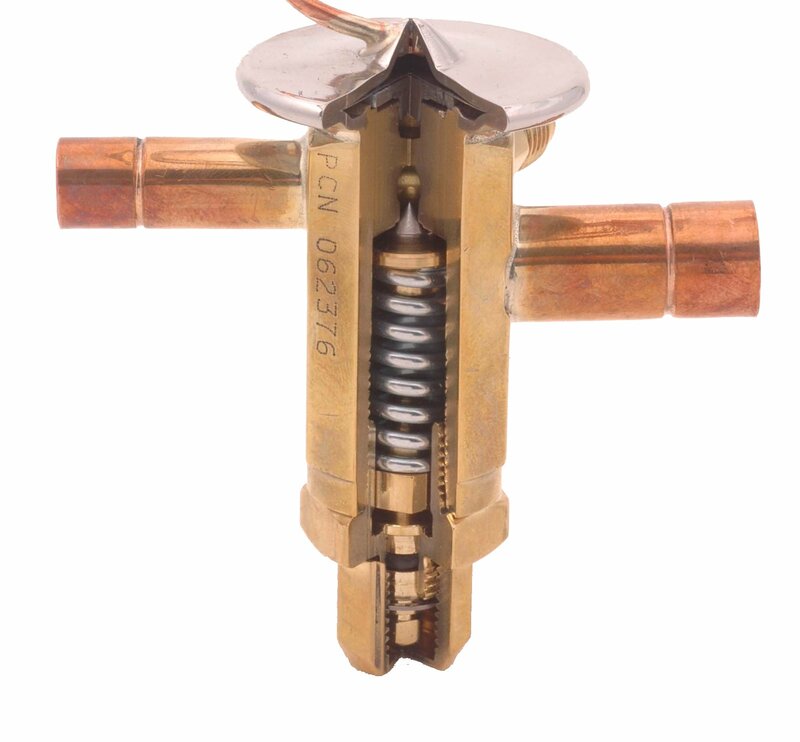 Expansion valves usually fail by becoming clogged with small particles from your air conditioning system. The orifices are so small you will not be able to unclog the valve, so your only option is to replace it. The cold refrigerant then travels to the last piece of equipment in the air conditioning system of your vehicle, the evaporator. The evaporator is located in the air ducts, usually just before the heater core. The cooled refrigerant cools the evaporator, which in turn can cool the air in the cabin of your vehicle. Like the condenser, the evaporator is very delicate and usually fails due to a leak in one of the lines or a puncture in the evaporator itself. Since the evaporator is in the cabin of your vehicle, it is usually well protected and rarely fails due to a puncture. Since your air conditioning system uses clean refrigerant and is a closed system, the compressor, dryer and expansion valve are subject to very little debris or harsh environments and don’t often fail. When they do, usually the only solution is to replace the component in its entirety. Depending on its location and your skill as a mechanic, you should consider having a professional complete the replacement. Determining which component has failed can usually be accomplished by checking the pressures at different points around the system to determine what has failed or where the clog is located. The most common failure in an air conditioning system is a refrigerant leak, often at the condenser, but is possible at any of the connections from a hose to a pipe or from component to component. If the leak is severe, it may be necessary to replace the hose, or condenser or evaporator but in most cases these leaks can be sealed simply and quickly by using BlueDevil Red Angel. BlueDevil Red Angel A/C Stop Leak is specially formulated to seal the leaks in your system without damaging any of the delicate components. It is not a particulate sealer so it will not clog your expansion valve. BlueDevil Red Angel A/C Stop Leak will remain in your air conditioning system until it comes to leak point where the difference in temperature due to the leak will cause it to activate, causing a chemical weld to form quickly and permanently sealing your leak. Simply add the correct amount of refrigerant to your system and enjoy cold air all summer long. You can pick up BlueDevil Red Angel A/C Stop Leak at one of our partnering local auto parts stores in either an easy to use aerosol can or in a bottle to be used with an oil injector. You can also purchase BlueDevil Red Angel A/C Stop Leak online directly from BlueDevil online. Pictures provided by: www.emersonclimate.com and www.lwservices.com. Just so I understand. Do I still need to add Freon refridgeant after adding the Red Angel? Yes, you will need to add refrigerant after installing Red Angel. Is red angel safe to use in a prius with electric compressor? The Red Angel should not be used in vehicles with an electrically driven compressor. Hybrid vehicle contain the electrically driven compressors and they require a very specific type of conductive oil. circulated into my A/C system? You may simply run the A/C on max for 15 – 20 minutes after the Red Angel is installed. If my cars ac has been diagnosed with needed a new compression core or evaportor core, for 875.00 plus labor,will this product work? The Red Angel A/C Stop Leak & Conditioner would seal a leaking evaporator, however, it would not be intended for leaking compressors. A hard part repair sounds like it may be your best option. i have a small leak at the line going to my ac condenser on a 2009 dodge ram 1500, Took it to the dealer, they found the leak and said its due to corrossion where the line enters the condenser. They say $1200.00 to replace the condenser and line. It takes about three months to loose the cooling. Is it worth a try to use your sealer. Also they just recharged the system a couple days ago, If i can use your product will it work being the system is full of refridgerant. Red Angel A/C Stop Leak (http://store.gobdp.com/a-c-stop-leak-aerosol-00222/) will work to stop leaks in both the condenser or any of the connection hoses. The leak you have described is a slow leak so you should have no problem sealing it by injecting Red Angel. The A/C system must be either empty to partially depleted in order to add Red Angel. My 1997 Jeep Grand Cherokee ‘s a/c was blowing out the defroster vents only except occasionally when I’d let off the gas, the deflector door would close allowing the air to flow through other parts of the system. I diagnosed it as a vacuum leak, found the leak and repaired it. Now if the vehicle sits, idling, for a few minutes the a/c starts blue wing warm air. It only cools off again until driven for a while. The radiator shroud has been broken and discarded. Can you give me some advice on where to start trouble shooting this problem? Thanks for your question about your 1997 Jeep Cherokee. The problem you’re having could be similar to the last vacuum leak you fixed and simply be evidence of a leak to your air blend door. The other problem could be that at idle your condenser isn’t getting enough air flow through it due to your missing fan shroud. You can try replacing your fan shroud or installing electric fans to remedy that situation. I have a 04 dodge ram 1500 and the mechanic says that the condenser is clogged is there a way to unclog it without getting a new condenser? Thanks for your question about your 2004 Dodge Ram. Usually, no there is no way to unclog your condenser. There are lots of small tubes and passages in your condenser that it great for cooling your refrigerant but almost impossible to remove any clog that it may have. The best thing to do if you have a clogged condenser is to replace it. My AC on my Jeep would not hold Freon for more then a day. I put in your product. Now when I try to add Freon the gauge is showing max pressure before I add any Freon and compressor does not go on. What’s the issue? To confirm, are you saying you were losing the total capacity of Freon in one day or that it started blowing warm air again after one day? Is it possible that the system is overfilled at this point? Please contact our technical support line at 888-863-0426 so that we can get a little better understanding of the vehicle’s condition and be able to make any appropriate recommendations. How Can I Stop my Standard Transmission Leak? — Where is My Oil Leak?